The P & P Tourist Resort inaugurated on the bank of river Yomgo hardly three month back is inviting accident from several corner. The resort is still to be completed in all respect while a security fencing immediately required in its one side of the complex facing towards river side. The front side of the resort face toward river which is one of idle place for tourist to enjoy but it would be a source of accident due to lack of security fencing while the major portion of the huge protection wall have been collapse and need immediate repair for safety of the tourist resort. On the other hand several tourist who visit the resort to for glimpse of the riverside may face accident and danger and life threatening. 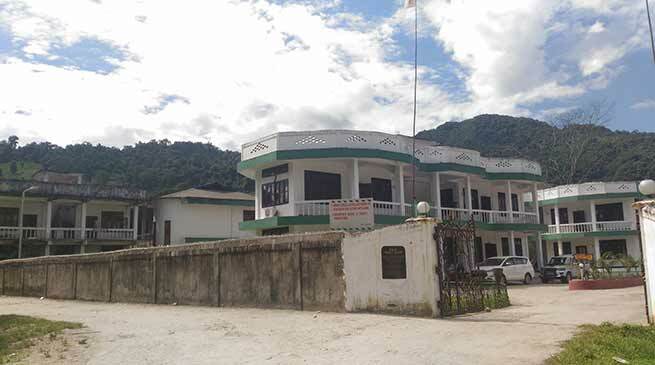 The attention of the west Siang district administration is drawn for taking safety and security measure for visitors and tourist to avoid accident a tourist who visited with his family from Andhra Pradesh said. Another youth who were there with their friend for tea in evening said that even there is no proper watchman while many rooms of the resort is still to be completed and yet to function. Another guest while said that jungle and bushed have grown up in its major area and need cleanness all around the campus which would attract more theorist.